This three bedroom house property is located in the Gran Vista complex, arguably the best private urbanization in the Gran Alacant area. Nestling in the hills above Alicante Bay, this private complex has stunning views over Carabasi beach and across to Alicante city and its castle (Castillo de Santa Barbara). The urbanization disposes of more than 30,000 m2 of gardens area mapped out by small footpaths amidst the Olive and Nispero trees. Nicely surrounded by green lawn you will find 4 swimming pools, (2 of which are for kids), 2 tennis courts, a football playing area and playground for the young ones. The community has its own convenience store and restaurant. This stunning quiet community enclosed by separate entrance and exit gates benefits from 24 hours security (during summer) making a perfectly safe place for family holiday. 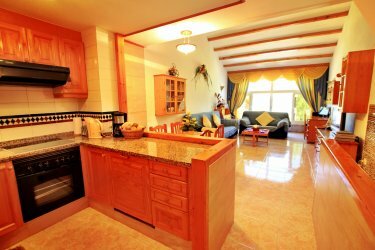 The house is tastefully decorated, fully air conditioned and nicely furnished. It has three floors with the ground floor being the middle floor which is directly accessed by the front parking/patio area located in the font of the house. On the ground floor you find the Living room/Dining room, Kitchen and a full bathroom. The large lounge/dining area has all that you would expect from a living room; 2 large sofas seating up to six people comfortably surround the coffee table (additional 4 stools under it), and a dining table with six chairs. The room is fully equipped with TV/Video, DVD, Satellite receiver, CD player and telephone (incoming calls only). A corner of this spacious room has been set aside as a work station with a desk and a computer connected to a broadband internet connection. The fitted kitchen is fully equipped with Cooker/Oven/Extractor, full fridge/freezer, microwave/toaster slot, dishwasher, kettle and double sink. You will also find pots and pans, crockery, glasses and variety of kitchen utensils including cutlery. The fully equipped bathroom on this floor is fitted with a bath, power shower, wash hand basin and bathroom furniture. On the first floor which is accessed via an interior set of stairs there is the master bedroom over looking the living area through a wooden banister. It has a large queen size extra comfort bed and bed side table, a built in wardrobe, and a chest of drawers. The lower floor can be accessed either via the stairs or via the back garden through the conservatory. It has 2 bedrooms, another fully fitted bathroom and a laundry & storage room. The second bedroom has 2 single beds which can be joined together into a double one, bedside table, 2 built in wardrobes and drawers/cupboard unit. From this room you can access the small conservatory and the garden. The third bedroom has a bunk bed unit with wardrobe making it ideal for 2 kids or young adults. The laundry & storage room has a washer/dryer machine, an extra freezer and is fitted with plenty of shelves. In general the house benefits from a lot of natural light due to its large windows. It should also be mentioned that the immediate large green area behind this house is often used to set up sun beds by the near neighbors, making this a highly sought after property within the Gran Vista complex. Gran Alacant is situated in the region of Costa Blanca or 'White Coast'. It is renowned for its great beaches and lively resorts, running from Denia in the north to beyond Alicante in the South. It is an ideal base from which to explore the diverse Valencia hinterland. Situated in the immediate region is Alicante city and some of its local towns are Torrevieja, La Marina and Benidorm. 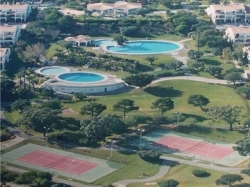 The nearest local town to Gran Alacant is Santa Pola. Alicante boasts some of the best beaches on the Costa Blanca. Spanish beaches are the most environmentally healthy in Europe. Spain came out top of all of Europe and leading the way within Spain itself was the Costa Blanca, which received 48 Blue Flag awards. Also note that the majority of these beaches are wheelchair accessible. One of the best Alicante beaches is just to the north of Alicante at San Juan, a wide expanse of soft white sand with sun beds and umbrellas for hire. Lining the promenade is an array of shops, bars, restaurants and ice cream parlours. Heading further north from Alicante is another of the excellent Alicante beaches - Platja Muchavista. Coming south closer to Alicante - yet another of Alicante Beaches - is the Cabo de la Huerta which is good for snorkeling. Closer still to Alicante is Platja De L�Albufereta with around 500m of soft sand. In Alicante itself is the Postiguet beach which is close to the marina and is popular with locals at lunchtime, evenings and weekends. Continuing south from Alicante and heading towards Gran Alacant is Platja de Babel, again good for snorkeling and fishing from its rocks. No more than 5 miles from Alicante centre and one of the closest to Gran Alacant (2min drive) is the excellent beach at Los Arenales Del Sol, a typically Spanish seaside resort with a number of bars and restaurants and great views across the Alicante Bay. The beach here merges with the beautiful, dune backed Carabasi beach also with good views to Alicante. Be warned � part of the beach here is a designated nudist beach! Further south is the near by town of Santa Pola which has several excellent beaches all within easy walk of shops, bars and restaurants. Gran Alacant can be said to have the best of both worlds. For those looking for a relaxing holiday and also plenty to do for those looking for something a bit more active or fun. With easy access to Alicante city (15 mins) and the excellent motorway network, there is plenty to see and do in the surrounding areas. Less than 40 minutes by car is the exciting Terra Mitica theme park to be enjoyed by both adults and kids just outside Benidorm. Also in Benidorm nestling in one of its hills is the superb water park Aqualandia which is next to Mundomar the sea life centre. Night life in Gran Alacant is low key with the emphasis on good food and good wine with more than 40 bars and restaurants to choose from. Nearby Santa Pola (7 mins drive) has a good selection of restaurants from simple tapas bars to the highly recommended Miramar and Baptiste by the quayside. Nearby, Alicante has numerous bars, restaurants and night clubs catering for its cosmopolitan clientele. As you would expect Gran Alacant also has pharmacies, supermarkets local market, banks (all with cash machines), panaderias (bakers), heladerias (ice cream parlours), a video/DVD rental shop, internet caf�, hairdressers, nail bar, petrol station and car/scooter rental agencies. Close to Gran Alacant, and just over one mile down the hill, is the typically Spanish resort of Los Arenales del Sol. Facing onto miles of sand dunned beaches, cleaned each day, Los Arenales is a popular weekend destination for people from Alicante and families from all over Spain have holiday homes here. In the resort are plenty of bars and restaurants some with superb views of the sea and Alicante on the other side of the bay. During the spring and summer water sports of all types are available from the beach. For beach lovers, a lazy day in Los Arenales is highly recommended. The few miles distance to the airport make Gran Alacant a particularly good place to stay as you can be in your holiday rental accomodation in less than 15 mins from landing, and, because Gran Alacant is not on the flight path, there is no aircraft noise. Take a taxi to Gran Vista in Gran Alacant (10 mins � around 18 Euros). Exit the airport direction Alicante / Santa Pola, at about 1 km down the road exit to the right joining the N-332 direction Santa Pola / Cartagena. Drive for about 5 Kms going through the tunnel and then take the second exit on your right to Gran Alacant. Directly opposite this exit on your left is the Gran Alacant Petrol Station (Gasolinera). At the first roundabout continue ahead and up the hill until you come to a second roundabout. Take the first right and go passed the BBVA bank and shops on your right. Immediately after this block of shops and on your left you will see an enclosed Urbanization by 2 gates with a tiled sign - Gran Vista. From the A-7 and after you�ve passed the Alicante Puerto Exit; take the next exit direction Airport (Aeropuerto) / Santa Pola. By pass the airport on your right and head straight for the exit Santa Pola / Cartagena joining the N-332. Then follow instructions as indicated above. Lower floor is a wheel chair accessible from the garden patio door which leads to the second bedroom and the second bathroom. The ground floor is wheel chair accessible from the main front door of the property which leads to the living/ dinning room, the first bathroom and the kitchen. The Top floor, which leads to the master bedroom, is not accessible for wheel chair. For those who enjoy walking, there are a number of clearly marked footpaths in the Nature Park that surrounds Gran Alacant. Birdwatchers will also enjoy following the trails as there are many species to be seen at all times of the year. A little further a field there is excellent walking area towards Santa Pola lighthouse whose light can be seen most evenings from Gran Alacant. Carabassi Beach, running several kilometers from Arenales, is one of the loveliest and safest beaches on the whole of this coastline and is at the bottom of the hill just 10 minutes walking. You can also spend a day in the purpose made picnic areas (with barbecues) or eat at one of the many bar/cafes in the little resort town of Arenales Del Sol. You can also spend a full day at Tabarca Island 30 minutes away from Santa Pola by boat. It has many fantastic sea food restaurants and considered a favorite place for scuba divers. Special rates available for long stays (4 weeks and up). 5% discount for early bookings (before 12 weeks). 10% discount for early bookings (before 36 weeks). 10% discount for last miniute booking (less than 1 week).